Pen, Ink and Wash on laid paper watermarked J Whatman. Bought by Derby Museum and Art Gallery at Mellors and Kirk Fine Art Auctioneers, Nottingham. Burdett was a cartographer, surveyor and topographical artist. In 1765 he moved into the tall house on the left hand side of the street (next but one to the alms houses) which he had his friend, the architect Joseph Pickford (1734-1782) remodel in the fashionable Gothick style. A friend of Joseph Wright of Derby (1734-1797) – who painted a double portrait of Burdett and his wife – his circle included many of the leading figures in the Midlands Enlightenment. Amongst others, he corresponded with such luminaries as Benjamin Franklin. His many interests ranged from astronomy and music to printmaking, producing the first aquatint printed in England. 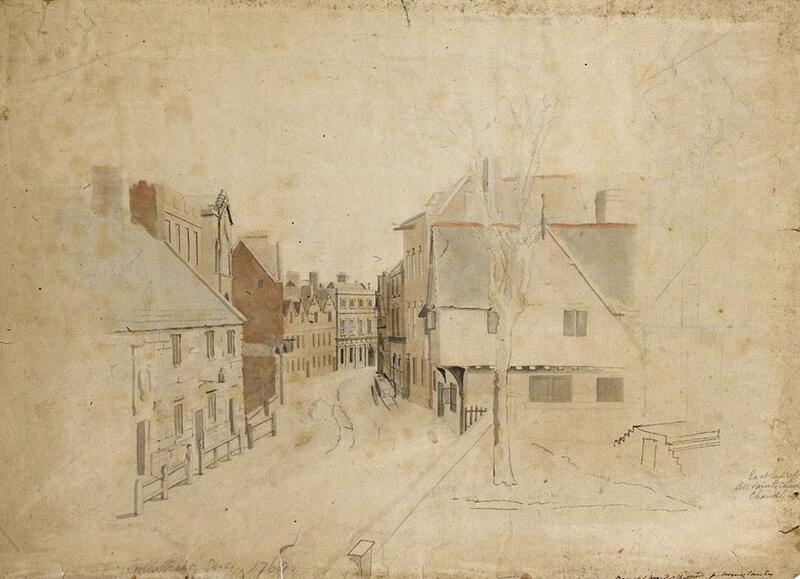 This apparently unfinished drawing shows the east end of Derby Cathedral on the extreme right hand side which is all that now remains of the scene. It was copied by George Bailey (1832-1925) and published as a postcard by Richard Keene, Junior of Derby in 1905. In 1768 Burdett left Derby for Liverpool so as to avoid his creditors, before settling permanently in the Margraviate of Baden in 1774.